I have eaten a whole pizza in NY and in San Francisco. Was stone baked and just a maghareta but managed the while thing. If it had been deep pan and had any toppings I wouldnt have made it!!! I get the comment about pizza not being all that healthy. My argument would however be, if you make it yourself, rather than get take out, you can change a lot of the reasons it tends not to be. I make pizza with a substantial amount of varying degrees of whole grain flour in the dough, (which would be a big no no if you'd ask any italian) making the sauce myself, using comparatively small small amounts of cheese and stocking up on vegetables (like olives, sjallots, red onion, mushrooms, peppers) for topping. Pizza doesn't need to be comparatively that unhealthy at all. I eat pizza because it tastes nice, not for health benefits... YOLO and all that. Well, I actually prefer it like that taste wise, but to eaches' own. Cheese. You must have nice toasty cheese for pizza to taste right. halfwise wrote: Italian pizzas are the size of a smashed bun. Or did you have it in Britain? it was a real pizza. Long was this Doom foretold. pizza is just bread and tomato and cheese, why is it unhealthy? its not fried. I suppose by "real pizza" you mean italian. I really don't know where to tally it. Let's just publicly state that the Italian representative had 4 slices. Half the concept is that white flour is unhealthy, which I can agree with. The other half of the concept is that cheese is unhealthy, which I totally reject. halfwise wrote: Cheese. You must have nice toasty cheese for pizza to taste right. Mrs Figg wrote: pizza is just bread and tomato and cheese, why is it unhealthy? its not fried. Not necessarily, maybe in the american sense, but pizza with less cheese is rather the norm rather than the exeption in places like Italy. Hell, italians will even make you pizza without any. Pizza marinara is among the first styles of pizza ever made, in Napoli. I do like cheese, like mozarella, on a pizza though, just not the cheese mountain you get with some take aways and in some eateries, and particlarly with home made and deep freezed pizza in noruega, with the cheese drowning any other flavour. I guess it's not as much a health thing as a taste thing for me. Italians may have invented pizza, but Americans popularized it. And it's popular because of the cheese. Hell, most Chinese turn up their nose at cheese....unless it's on pizza. Without the toasty cheese it's not pizza; it's a flattened out bread-bowl. All this talk of pizza made me hungry, so I nipped off across the street and had a slice for breakfast. yeah me too. nice thin and crispy Margherita yum. Another one? Are you Italy or Britain? halfwise wrote: Italians may have invented pizza, but Americans popularized it. And it's popular because of the cheese. Hell, most Chinese turn up their nose at cheese....unless it's on pizza. Without the toasty cheese it's not pizza; it's a flattened out bread-bowl. That's certainly what I'd expect the american perspective to be. To take the example of Norway, I think people on the whole sees pizza as originating in Italy. People still eat it, but the whole trend of american pizza has gone rather out of fashion with the american cultural imperialism of the 80s and 90s. 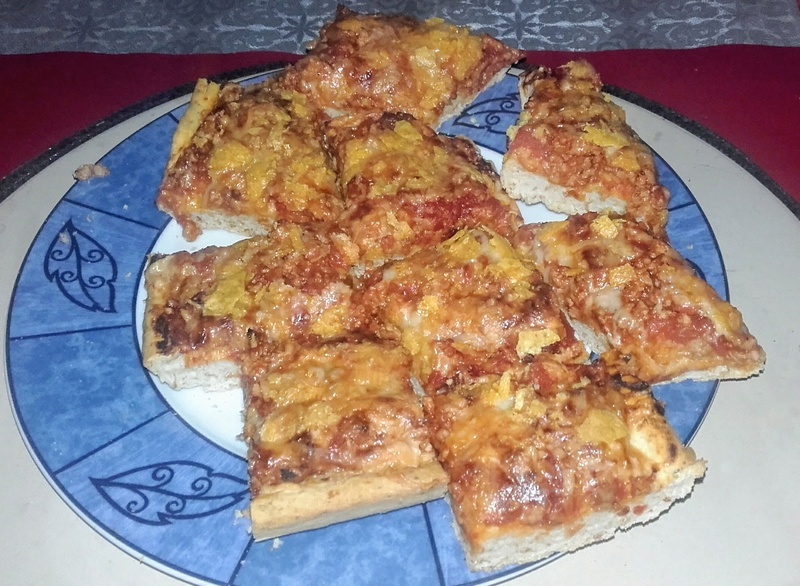 Our version of american pizza was always thick doughed, cheese heavy boring affairs though. halfwise wrote: Another one? Are you Italy or Britain? where the real ones are made. natch. Bluebottle wrote: To take the example of Norway, I think people on the whole sees pizza as originating in Italy. I don't think anyone in America disputes that pizza was invented in Italy. Many pizza places here emphasize the Italian connection in their names, logos, and decor even though they almost all serve one of the American styles. Italy invented it, we taught it to the world. After adding a suitable amount of cheese. I threw together a homemade pizza on the 26th. It was done just before the storm 'Urd' cut the power, so we ate by candlelight. Minced meat, taco spice mix, crushed canned tomatoes and cheese. It wasn't a super thrilling taste feast, but it was ok and the kids loved it. Very shiny due to the flash on my phone and the mysterious substance called "topping" mixed with the cheese. I throw in some wholemeal flour to make it a tiiiiiny bit healthier (and more filling). The dough doesn't rise as much then as a pure white break dough would. Okay, but how many of those slices did YOU eat? Need it for the tally.